With a 170-mile march and an indefinite strike, Zimbabwe's rural teachers are showing the importance of maintaining pressure after political change to ensure genuine transformation. Remember that Monday morning feeling, your lethargic legs dragging you begrudgingly back to the classroom? Jan. 7 was nothing of the kind for about 100 students in Harare, Zimbabwe. Their teachers set up their classrooms in Africa Unity Square. Excitement filled the open air, even as police lurked nearby. Ultimately, however, school didn’t last long that day. Before lessons even kicked off, the police stormed the public classroom, arresting nine members of the Amalgamated Rural Teachers Union of Zimbabwe, or ARTUZ, who were offering free open air schooling, despite being in the midst of an indefinite strike. Fortunately, the teachers were released after just a few hours of detention, and they returned to what they are calling their #SalaryCamp — an occupation outside the office of Finance and Economic Development Minister Mthuli Ncube. Teachers had launched the camp in response to Ncube having revoked salary payments in U.S. dollars — as guaranteed in their contracts — and sliced annual bonuses by nearly a half. The persistence of the #SalaryCamp, which has escalated into a nationwide multi-industry strike, is currently facing severe repression by Zimbabwe’s government, including extrajudicial killings and internet blackouts. Yet, all this would not be happening if it weren’t for a bold step taken by rural teachers one month and 170 miles ago. 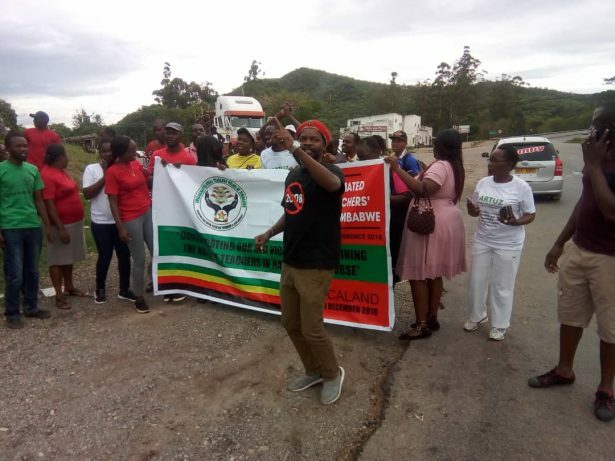 On Dec. 9, ARTUZ members and a few allies set off from Mutare — a rural province hosting the annual ARTUZ conference — on their way to Ncube’s office in Harare. They quickly encountered the expected challenges: foot blisters, inadequate shelter and fatigue. Soon, however, these obstacles were supplemented by arrests, police blockades and one of the marchers going into labor. Their persistence to reach the capital city was nothing short of remarkable. Zimbabwe’s rural teachers didn’t wake up one morning with a whim to march. Their position on low pay and poor working conditions has been long standing. In October 2017, ARTUZ declared rural teachers the most heavily affected public servants by Zimbabwe’s cash crisis — a shortage of U.S. dollars, which had been publicly preferred to the hyperinflated Zimbabwean dollar or the illegitimate bond notes introduced in 2016. To express their lack of basic needs, teachers undertook a “pockets out” campaign in September 2017 to remind the public of their plight. Former Education Minister David Coltart joined the action, as did people of all sectors across Zimbabwe who felt turning their pockets inside-out was a safer way to express their destitution than participating in a heavily-policed protest. This campaign was insufficient in achieving the demands of the public servants. To make matters worse, in October, Zimbabwe’s government began violating its negotiated agreement with the teachers by refusing to pay them their $100 per month salary in U.S. dollars. The government started paying teachers in bank transfers that reduced actual salaries to about a third. Adding insult to injury, annual bonuses were nearly slashed in half. In a letter addressed to Minister Ncube on Dec. 4, ARTUZ secretary general Robson Chere announced the march to the capital, promising to “storm Harare” upon their Dec. 19 arrival. A call went out the same day to all ARTUZ members — as well as other teachers organized by the Federation of Zimbabwe Educators’ Union — to join the caravan. A day later, over 500 people had registered for the march. But in a country where public order laws are designed to curtail nonviolent public dissent, it is not uncommon for those numbers to dwindle in the lead-up to any protest. Still, as expected, participants began to drop out as the day to start the march drew close. In fact, by the time they began the journey on Dec. 9, only 102 marchers showed up. However, others joined on the way, as the caravan passed through numerous villages. The march was also helped by having leaders from the Citizens’ Manifesto — a national platform working to unite Zimbabweans around a common political vision. On the third day of the march, morale was high among the teachers and their allies. They even had a sense that nature was on their side, as they watched heavy rains pelt the surrounding areas, but never their route. The state, however, was not on their side. According to an update issued by ARTUZ, police with vicious dogs had already begun trailing the caravan. By day six, only about 63 members were in able-bodied condition to carry on with the march, but ARTUZ was not ready to let its power dwindle. So those who could not continue were invited to send personal messages to Ncube’s desk. Others offered food and other basic necessities to those sticking with the march. These were strategic attempts to broaden participation and solidarity beyond the march itself. Soon after this, the caravan encountered a police blockade. Marchers argued that, like churches and funerals, trade unions are exempted from Zimbabwe’s Public Order and Security Act – a law often employed by the state to curtail public dissent. Allied lawyers under the banner of Zimbabwe Lawyers for Human Rights, or ZLHR, attended to the matter swiftly on behalf of ARTUZ. Nine members were arrested and charged with criminal nuisance. Although court proceedings led to their release two days later, thanks to ZLHR’s intervention, police continued to follow and harass the caravan. This perpetual stalking of the march resulted in 14 subsequent arrests in Ruwa on Dec. 18, the day before the caravan had planned to shut down Ncube’s office. 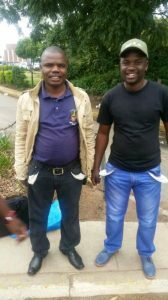 Those detained at Harare Central Police Station included ARTUZ’s president, vice president, secretary general and other union members. 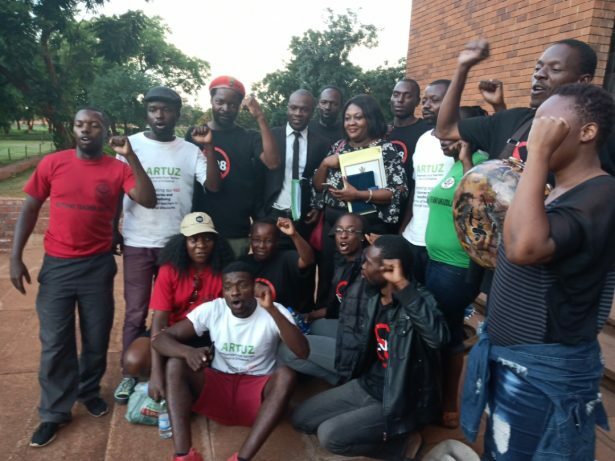 With the aid of their legal allies, they were eventually released on Dec. 19, but the delay caused by their detainment introduced a new challenge: After all the planning and expenses, they could no longer “storm Harare” on Dec. 19. Instead, they had to deliver the petition a day later than originally intended. The petition was delivered on Dec. 20 with dwindling numbers, but not necessarily dwindling morale. One of those not present was march participant Rudo Mlangeni. After walking the first day of the caravan while pregnant, she had taken rest and went into labor on the day of the picket. Since there was no climactic victory outside the Ministry of Finance on Dec. 20, ARTUZ issued an ultimatum to the government. The union informed its members that they would give Ncube two weeks to address their grievances. If he failed to respond, they would return to his office on Jan. 7. Predictably, Ncube kept quiet. ARTUZ has issued an indefinite strike until the grievances are addressed. The #SalaryCamp in Harare is offering additional festivities beyond open air classroom lessons. On Jan. 8, the streets were filled with those playing sports, which attracted the attention of those passing through downtown Harare. Members of the union are mindful that their cause doesn’t exist in a vacuum. Much as they extended the 2017 pockets out campaign beyond their sector, they have begun canvassing health workers and those of other industries to join in the strike. It comes at a particularly strategic time, when public offices throughout the country are supposed to resume work with a load of matters that have accumulated over the holidays. Zimbabwe’s government is already busy publishing propaganda to undermine the union’s effort to consolidate power beyond its own membership. 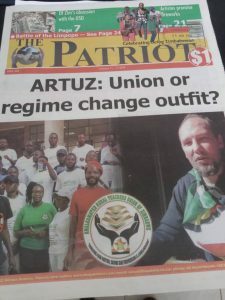 The story of the ARTUZ march to Harare offers a window into the principle of maintaining pressure after political change to ensure genuine transformation. Dictators around the world are falling, but this doesn’t always bring an end their regimes. Unjust policies, corrupt institutions and regressive governance cultures oftentimes live on. In the case of Zimbabwe, former dictator Robert Mugabe — who spent over 30 years in power — may have succumbed to the reign of a successor, but such transition shouldn’t be confused with actual transformation. The next days and weeks will determine whether Zimbabweans are well organized enough to wage resistance in the face of brutal crackdowns. The end of Mugabe’s rule may be have been a milestone, partially achieved through the power of common people, but it certainly isn’t a finish line. 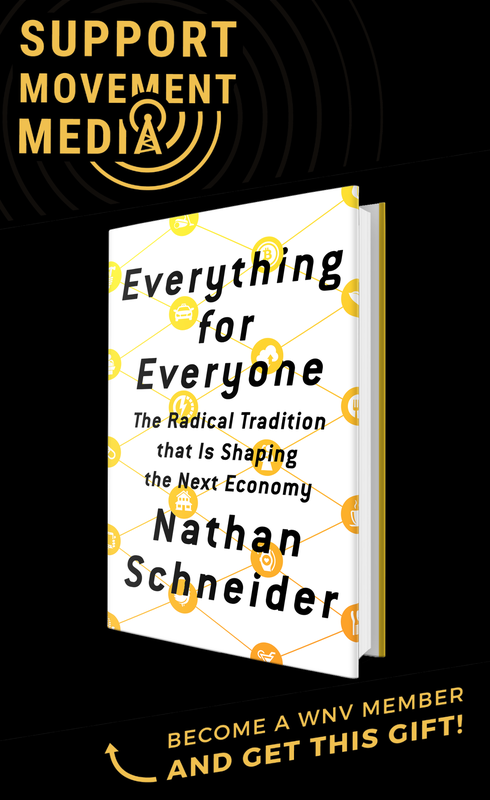 Organized labor in Zimbabwe is recognizing this and taking power into its own hands to challenge kleptocracy, police brutality and other state vices that have — over the generations of a single man’s rule — become normalized. Only with this tenacity will Zimbabwe build up functional policies, institutions and governance cultures that run according to the will of its people.